The Offset module lets you position the root of your deformation chain. It is automatically added to your Deformation Group when you create a deformation rig using the Rigging tool. When you move your chain using Setup Mode , the values at the top section of Layer Properties will be updated to follow the new resting position. If you move the chain without being in the Setup Mode, you will be able to animate the active position of the chain over time, in that case the bottom values will be connected to functions. • Name: Use this field to rename the module. • (x) Axis: This value sets the resting position of the Deformation-Root on the X (east/west) axis. You can enter the value, use the up and down arrow buttons to choose a value, or use the Transform tool while in Setup Mode to reposition the deformation chain. 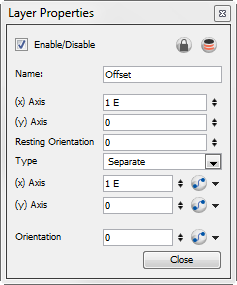 • Resting Orientation: This value sets the rotation angle of the resting position of the Deformation-Root. You can enter the angle, use the up and down arrow buttons to choose the desired value, or use the Transform tool while in Setup Mode to rotate the deformation chain. • Separate: The two coordinates are set separately. If they are connected to a function, each one will have its own function curve. This is the default setting. • 2D Path: The two coordinates are set together within a single 2D path function. • (x) Axis: This option is only available when the Type is set to Separate. It is used to set the active position value of the Deformation-Root on the X (east/west) axis. You can enter the value, use the up and down arrow buttons to choose a value, or use the Transform tool when Setup Mode is NOT enabled to move the deformation chain. Remember, that if you want to add a keyframe, you need to enable Animation mode from the Tools toolbar. • (y) Axis: This option is available when the Type is set to Separate. It is used to set the active position value of the Deformation-Root on the Y (north/south) axis. You can enter the value, use the up and down arrow buttons to choose a value or use the Transform tool when Setup Mode is NOT enabled to move the deformation chain. Remember, that if you want to add a keyframe, you need to enable Animation mode from the Tools toolbar. • Path: This option is only available when the Type is set to 2D Path. It is used to set the active position value of both Y and X axis. Use the Transform tool when Setup Mode is NOT enabled to move the deformation chain along the 2D path. Remember, that if you want to add a keyframe, you need to enable the Animation mode from the Tools toolbar. • Orientation: This value sets the rotation angle of the active position of the Deformation-Root. You can enter the angle, use the up and down arrow buttons to choose the desired value, or use the Transform tool when Setup Mode is NOT enabled to rotate the deformation chain. Remember, that if you want to add a keyframe, you need to enable Animation mode from the Tools toolbar.